Housing market situation in terms of supply, demand (from take-up rate), total units and value, of over 1,800 projects units sold / remaining, and sales rate per month classified by 78 locations, 6 housing types and 8 price ranges, each with detailed maps. 1. Launches of new real estate projects (residential, commercial, industrial and resort properties) on a nationwide basis from January to December 2017. This is to clearly analyze the Demand and Supply situation. 2. Key differences between successful projects and unsuccessful projects. Examples of the 10 best-selling and 10 worst projects. 3. Updates on road proposals and city planning affecting property markets and location analysis. 4. Case studies: Changes in price of the same housing projects grouped by type over time. 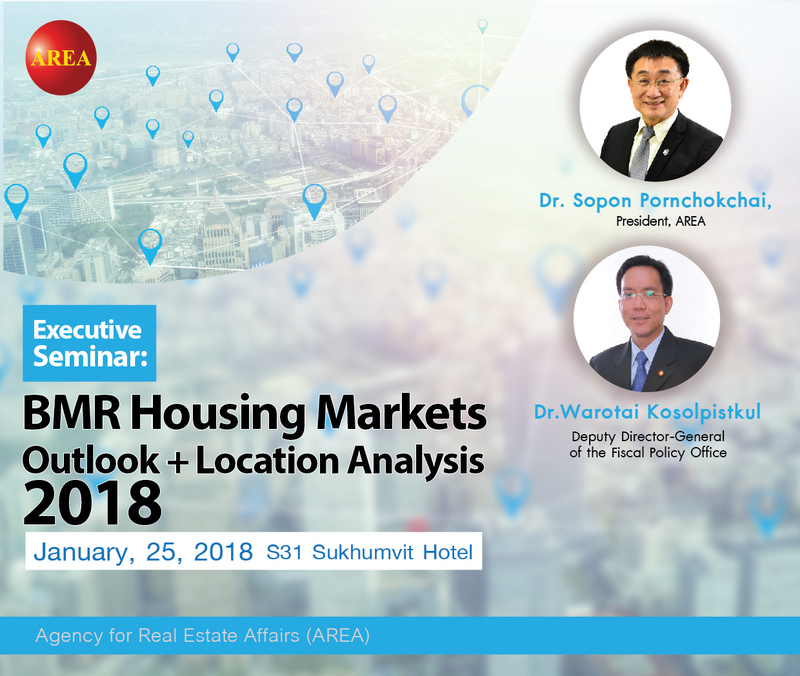 Dr.Sopon Pornchokchai, Ph.D., D.FIABCI, CRS, MRICS, President, Agency for Real Estate Affairs (AREA) He is an experienced valuer and researcher in Thailand and the ASEAN Region. Prior to starting AREA, he has been a consultant to the World Bank, ESCAP, UN-Habitat, ILO and the like. He is an international advisor to the Appraisal Foundation established by the US Congress. His research master pieces include the discovery of 1,020 slums (1985), CAMA (computer-assisterd mass appraisal) modeling (1990), forecast of 300,000 unoccupied housing units (1995 and 1998), study for property information centre (2000), land value modeling (2002), the roadmap for valuation profession (Ministry of Finance Vietnam, 2006) and the consultancy service to Ministry of Finance, Indonesia (2008), Infrastructure Project, World Bank (2010), UNCHS Vietnam (2011), ASEAN Housing (2015), UN 200 cities (2016).